A little different episode today, but critically important for all of us. Apple is fighting the FBI’s demand that the company create malware to break into the iPhones of the San Bernardino killers. A judge has ordered the company to do it but Apple is looking to appeal that and Google is publicly siding with Apple. It’s important to understand that the government cannot simply obtain a search warrant because Apple itself doesn’t know, or have the ability right now to know, what data its customers store in the private areas of their iPhones. This is a straightforward constitutional issue and comes down to this question: Do we want to exchange essential liberties for a little safety? Benjamin Franklin gave us insight on that question. This is an important episode. 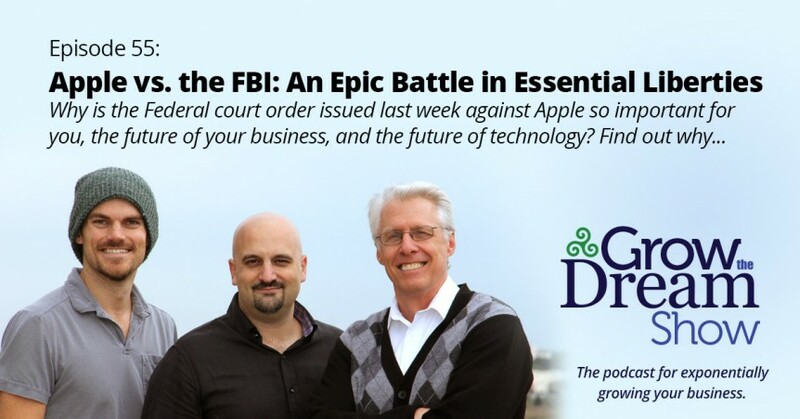 According to Forbes, the FBI is using the courts to force Apple to write malware. Seattle Times editorial: this is a slippery slope. Apple CEO Tim Cook’s letter to customers. “Freedom is a fragile thing and is never more than one generation away from extinction. It is not ours by inheritance; it must be fought for and defended constantly by each generation, for it comes only once to a people. Those who have known freedom and then lost it have never known it again.” —Ronald Reagan, Inaugural Address as Governor of California, January 5, 1967, echoing certain sentiments from John F. Kennedy’s Presidential Inaugural Address, January 20, 1961. Watch this episode of the Grow The Dream Show on YouTube.